In one of my current projects, we have an XML message that looks a little like this. For testing purposes, I want to use XPath to get values from this, i.e. match first-name to Angelo. For the last months, I have coached some engineering teams in a large software-intensive organization. Some are running fine, some need extra work. A topic that regularly pops up is "how do I handle all these interruptions during my day?" I define an interruption as anything that makes you context-switch away from the work you're doing for the team. So, questions from teammates are not interruptions. Neither is responding to email at the time of your choosing. Phone calls regarding different projects, or people showing up at your desk with unrelated questions are. Scrum ask for a distraction-free environment, routing interruptions through the product owner. 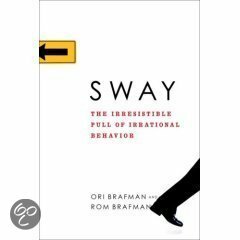 However, interruptions are a cultural phenomenon, not an organizational one. I will assume interruptions as a given of the current situation, channeling them in a productive manner, and slowly driving them out. "It has always worked like this"
People have lost trust that goals and deadlines will be met. Especially with deadlines far into the future, there is a track record of slippage and work not getting done at all. Managers have learned that anything not marked as urgent has a tendency to be left alone, and not get done. People get results by declaring emergency. And you know what? It works. This is ingrained into the organization, and hard to counter. Make commitments, and consistently meet them ("I'll get back to you next Friday"). Make promises, and keep them, and people will learn to accept you deferring work. We will get back to this. I promise. As engineers, we are inherently nice. When faced with the choice to either shine in front of someone present, of diligently work on for someone that isn't, we choose the former. But, apart from an opportunity to please, is this work really that important? This is about personal choice and reputation: build up a track record of being dependable, and your pushback will be more gladly accepted. Most interruptions are not that urgent at all, but our desire to please gets the better of us. To handle this well, we need to make a well-reasoned decision on the importance of the work before us. Personal productivity methods provide some help in this. For instance, my personal favorite Getting Things Done forces you to make a choice for interruption over two minutes: Do, Delegate, Defer, Drop. 'Defer' can be part of your system, but is more effective as a team. If you decide to deal with your interruption demons, and to not be as available for the team as you could be, you're hurting the sprint result. One of the teams has picked Tuesday as the 'interruptions day'. For every interruption, they ask "can this wait until next Tuesday?" The notion of core hours is written up best in chapter 10 of the Scrum Field Guide. In short, these are the hours every member is supposed to be available for the team. Outside of these hours your free to work the way you want, and any interruptions can be dealt with then. Making promises and keeping them it not external behavior, it is part of who you are. Be dependable to both your clients, and to yourself. If you make a promise to yourself to get some work done, treat it just the same as making a promise to someone else. If you need to break it, renegotiate. You can't be dependable without being authentic. We all know context switches are expensive, but just how expensive? How can you explain to the angry manager at your desk "ah, yes, well, you know, you bothering me will take roughly 22.6 minutes of productivity away. From another project." Remember, as engineers we're way too polite for that. Transparency. Don't hide incoming work in some support process, taking away control from your product owner. Make it visible that incoming work hurts by keeping it on the same sprint board as the regular work, and show this pushes out planned work. Start counting interruptions, and show the correlation between interruptions and velocity. spend time increasing product quality, so we end up with fewer emergencies. Well, what does that mean for you? What can you, as an engineer, do? Always wonder "what is the most valuable thing I can do at this moment in time" by consciously making the Do/Delegate/Defer/Drop decision. Build up a track record of dependability: make promises, and keep them. Real emergencies are rare. With your new aura of dependability, use it to manage interruptions even further. Ask people's input to be less disruptive: don't call, email. Don't visit your desk, create a well-written bug report. Use IRC if you must. This leaves you free to handle the interruptions regularly, but when you choose to. Every interruption is a chance to shine. Shine only at your own terms. Today I ran into a typical documentation problem. Organization uses mainly Word, but I don't use word. I want a solution that, while the documents are checked into subversion, is navigable in the browser. So, HTML is probably good, but I'm not going to write HTML by hand. I don't want any server-side code, and I also don't want to check in 'compiled' HTML. So, I wanted to write Markdown, and needed some way of processing it in the browser. Enter: Showdown. Isn't that an awesomely simple solution? Just type Markdown in the predefined div, save, commit, and enjoy. First up: for those that don't know Devnology, you probably should. Visit devnology.nl and sign up for one of the upcoming event! Devnology's third Community Day took place at Vx Company in Baarn, in the best-furnished basement I ever visited. The community day is like a one-day conference with blocks of time carved out for different sessions and workshops; I'm only human and have not experienced them all, so I just picked the ones I was a part of. "is to Eclipse as Google Docs is to MSOffice"
I liked the way he walked us through the various features and advantages of Cloud9, but I would have liked a more developer-oriented pitch. We were shown a quick demo of debugging and live changes, but nothing showed up that made me go "wow, time to ditch IntelliJ, Eclipse and TextMate at the same time!" Never too shabby to take an engineer out of his comfort zone, into the land of mathematics, Felienne Hermans flipcharted her way from ancient Greece's Zeno's Paradox through the more modern notion of Hilbert's Hotel. Felt a bit like infinity-related excerpts from The Clockwork Universe, all compressed into roughly an hour. Also, I'm very charmed by the let's-have-a-flipchart-and-start-talking way of presenting. What I didn't like so much is that there was too much material for the reserved timeslot; probably a day's worth of material paraded by in some two hours, barely leaving time for hands-on Clojuring. I hope Martin finds the time reduce the amount of material (to, let's say an afternoon), then I'll be first in line again! Well, no. As Michel expertly showed, even though human language is all about conveying meaning and alluding to another person's mental model of the world, the link to programming is pretty slim. Since in science there is no such thing as a failed experiment, I enjoyed this deviation from our usual programming-the-world view. Oh yes, it's such a first world problem. Yet, my Roomba has gotten stuck on my Ikea Poang chairs, about once every four or five runs. The solution I came to was elevating the chair a little bit. 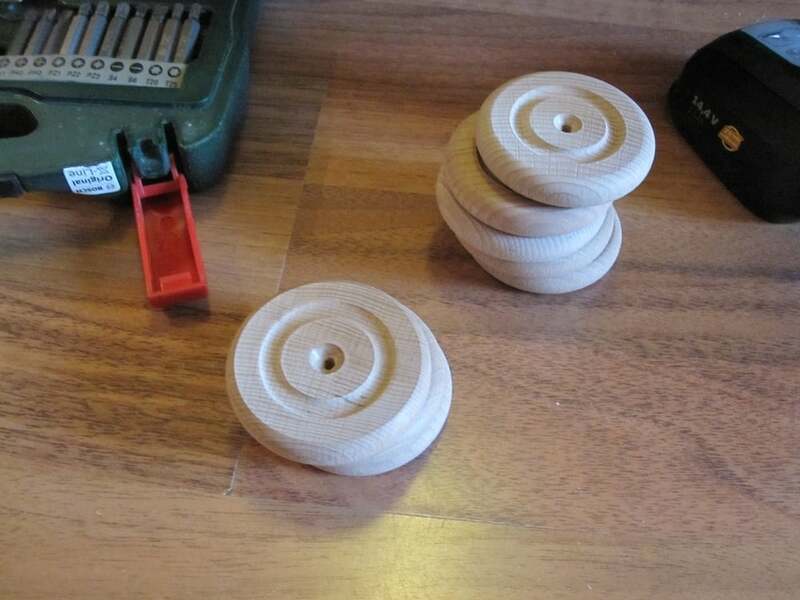 I bought some wooden wheels at Praxis (these are 60mm ones, intended to work as a wheel for, for instance, a storage box, or as helper wheels for a chair). They are intended to work as wheels, so they are built to have an axle in them. We want to screw them onto out chair, but without the screw sticking out; so, I made sure the screw would recess using a counter sink. Prepare the chair by pre-drilling some holes. I used a 3mm drill for this. Since the wheels' 60mm is just as wide as the chair's legs, there is no need to measure anything, just use your hand as a guide. Then, attach the wheels. I used 3.5x20mm screws. To top it all of, attach some felt protectors. I had some Ikea Praktisk protectors lying around. There you go! The chair is now just high enough so the Roomba's bumper will hit the chair instead of bravely trying to climb over it. Mind you: this works fine on my hardwood floors, but you may need some additional height if you have carpet. I gave a talk on ARL and the data evolution problem we find there at the Semantic Technology & Business conference, 26 September 2011. Most of the codebases I work on are in Subversion, yet I like working with Git for the sheer joy of it. Below, you will find a short overview of my basic workflow. I do a lot from the command line, but not everything. For most operations Mac Git client Tower is the best solution you can find. For the impatient reader, my workflow looks a little like this. Create awesome features, committing frequently with Tower. Git works with a local history, which makes it quite distinct from Subversion. Also, Git assumes that you have a working trunk, with optional branches and tags; this means your repository should at least have a trunk directory. This will copy over all revisions of the repository to your own system, placing a Git repository in your mylocalcopy directory. Since it goes through all revisions, this can take a while for repositories with a lot of commits. If Git somehow stops, and your local copy is still empty, go into the local repository directory, and execute git svn fetch. With your local working copy, you can use Tower to create your commits. Pushing your changes to the remote Subversion repository is roughly like rebasing. Again, it's best to only do that with a 'clean working copy', that is, having committed all changes to your own Git repository. git svn dcommit Again, if you must, you can pad this command with git stash and git stash pop. Remember that, when you commit, all your commits will get the timestamp of the dcommit. How do I use Git with Subversion? I have noticed that in Git, there are at least six ways to do anything you want. I have settled on a simplified way of doing things, and I know I am missing out on some awesomeness. I rarely use feature branches. I only use them when I am really working on two things at the same time, but not for every feature that comes along. When I do use feature branches, I tend to dcommit from the feature branch, instead of merging to my trunk first. Intellij's Git integration is pretty good, and it works together nicely with external tools. In Eclipse, I don't use any integration, but rely on command line tools and Tower only. For Eclipse-based projects, I use Git to keep track of the full working directory, instead of tracking individual Eclipse projects. This usually means that I clone some repository at the level above the Eclipse projects, and import the projects into Eclipse using the 'Import existing project' feature. A few weeks back, I gave talk detailing the Leren op Maat product on a mini conference around semantic technology, organized by Luminis. My colleague Richard created a very nice impression of this session. If it all sounds like Dutch to you, that's because it is. Earlier today, I gave a talk at Eclipsecon 2011. Attendance was pretty good with about 40 people. One of the most elusive, yet very useful parts of the OSGi specification is the ManagedServiceFactory (part of the ConfigurationAdmin specification, chapter 104 in the 4.2 OSGi compendium specification). A long time ago, I gave an example on the Apache Felix users mailing list, but it's hard to find. So, time for a nicer looking example. In the four steps below, we will take a simple program, and make a ManagedServiceFactory out of it. I find it useful to follow the progression, but if you're only interested in the ManagedServiceFactory part, skip to step 3. I assume you're familiar with basics of OSGi, and have seen a ManagedService up close before. I have put up an example project, which shows all the code covered below. When you import the project, you will get a warning about a missing 'test' folder. Just create a new 'test' source folder, this is due to Zip not being able to package empty directories. the Apache Felix Dependency Manager. At time of writing, this is gearing up towards a 3.0 release, but we use a SNAPSHOT version here; I've put one up for download. Once downloaded, you can drag it into the Bndtools repository. Apache Felix FileInstall, which you can download here. Step one, code in package net.luminis.websitewatcher.withmain. Suppose we want to have some service that checks the availability of our favorite website. It's pretty easy to devise a method that does this. Given that we have a method for this (full code in the example), we can call this repeatedly from a thread. Run this, and you will see whether or not Google is available from your machine, every five seconds. Step two, code in package net.luminis.websitewatcher.simplebundle and simplebundle.bnd. The start() and stop() methods are called by the Dependency Manager when our component is, well, started or stopped. You can see this working for yourself by running the bnd.bnd file in the project. 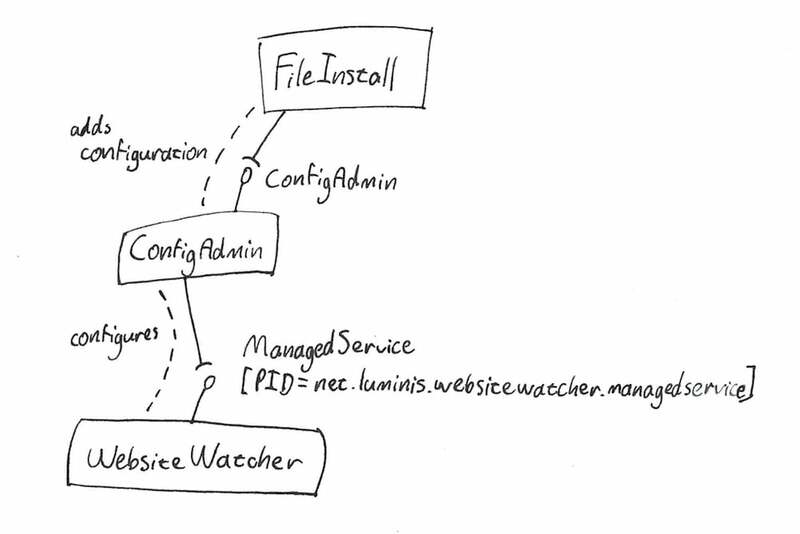 Step three, code in package net.luminis.websitewatcher.managedservice and managedservice.bnd. Moving it up one notch, we create a ManagedService out of our component. To do so, we make the WebsiteWatcher implement ManagedService, and add some contants we will need later. This takes some explanation. Line 3 is a nullcheck on the configuration we receive: null is a valid configuration if our configuration is being removed. However, we will let the Dependency Manager take care of wether or not our configuration is available, so we can ignore the null-case. Line 4 checks the availability of our configuration property, and on line 8 we create a new URL to watch from the URL property in the configuration. If any of these checks go wrong, we create a ConfigurationException telling the world what happened (lines 5, 11). Finally, we need to instruct the Dependency Manager of our newfound managed-service-ness. The Configuration Admin spec tells us that a ManagedService should be registered as a service, with the PID as a service property. When a configuration becomes available, the Configuration Admin will call that ManagedService with the configuration properties. The Dependency Manager nicely wraps this as a 'configuration dependency', i.e., our component can only start if it has a configuration. In the example project, we use the Apache Felix FileInstall bundle to get configurations into the Configuration Admin. It watches the load directory for files with a name like <pid>.cfg. You can play around with the configuration in net.luminis.websitewatcher.managedservice.cfg, and see what happens! Piece de resistance, code in package net.luminis.websitewatcher.managedservicefactory and managedservicefactory.bnd. Having a configurable watcher for a single website is nice, but we really want to be able to watch more sites, without having to create PIDs for each of those, or instantiating multiple watchers 'by hand'. This is where the ManagedServiceFactory comes in. The task of a ManagedServiceFactory is to create instances of whatever it manages, based on the configuration it gets. If a configuration is deleted, the deleted() method on line 28 will be called; we thus remove the related component from the Dependency Manager. Note the private volatile DependencyManager field: the Dependency Manager will inject an configured instance in each component that has a field of this type. Now we have a factory, we need to register it in our activator. And with that, we have a fully functional factory for creating numerous watchers of all you favorite websites. Apache Felix FileInstall will also handle factory configurations if you use filenames like <factoryPid>-<instance>.cfg, like net.luminis.websitewatcher.managedservicefactory-google.cfg. *ERROR* Configuration for net.luminis.websitewatcher.managedservicefactory.560fe0c0-a691-475e-854a-b4caab68f6d4 has already been used for service [org.osgi.service.cm.ManagedServiceFactory, id=39, bundle=10] and will now also be given to [org.osgi.service.cm.ManagedService, id=41, bundle=10] which you can safely ignore. This has to do with the fact that the configuration is initially linked to our factory, but is used to configure the generated service later on. By the way, you may have noticed that we wrote a new WebsiteWatcher for each step of the process, except for the last one: we just reused the one from step 3. Early last november, I visited ApacheCon NA in Atlanta, Georgia. I wrote up some trends I spotted there at my company's blog. Furthermore, the materials of my session on distributing and managing software on large numbers of embedded devices is now up on Slideshare. I'm more about some striking images and a live story than about self-descriptive slideware. Still, you could try to reconstruct the story I told. Have fun! The longer I work in tech consulting, the more people start to rely on my choices in tough situations. And, the longer I do that, the more I tend to gravitate to a pair of questions: "why" and "why don't you not". Let me share a short anecdote about the second one. I recently worked in a team extending a tool for a customer; this tool abstracts the configuration of a complicated device to a more understandable level. For some expert-level situations, you sometimes need information (indices, etc) that is generated later in the process. A colleague asked my help with this feature; it seemed to required us to entangle UI code with configuration logic. Not being happy about this, I started wondering "why don't we not do this"?" Is there a way we can change the problem? We chose to remove the information from the UI, but make it more prominent in the generated configuration. Given the audience of this feature (expert users), there is no problem in making the user dig around in the generated configuration. So, we all heard about the five whys; now add why don't you not to that list. Ask yourself, "what's the worst thing that could happen if we don't" and "how can we make this problem go away without solving it?" Some time ago, I tweeted about using both low- and high tech tools for creating presentations. Some of you that know me, know what I'm talking about; for those that don't, a quick run-through of the way I create simple graphics or highlights for my presentations. The bottom line: I use this setup because it's the quickest way to get an image out of my head, onto paper, and into my computer. Why would I use hand-drawn images? I grew tired of all the run-of-the-mill graphics people use in their presentations, and I'm not exactly a graphics guru with all the nice tools. Also, I'm highly impressed by Sacha Chua's The Shy Connector; while I don't strive to have all hand drawn presentations, I like the personal touch of something made by my own hands. paper. Need I say more? a pack of Sharpies. I order mine at Central Point. a Fujitsu ScanSnap 300M. I'm not sure they make these anymore, but the S1300M is supposed to be good too. my trusty MacBook Pro, using Keynote. As stated above, I need a quick way to get something out of my head, and into my keynote. Here goes. I like to put a piece of cardboard under the paper I'm drawing on, as these Sharpies tend to bleed through. I have a preset that takes the image from the ScanSnap, scans it in the second-best quality, and opens the result in Preview. Once opened in Preview, it's easy to copy-and-paste the image, or a part of it, to Keynote. Sometimes it's useful to enhance the image a little in Preview, e.g. by increasing the contrast or saturation, it depends on whether or not you want the images to have a paper-like texture. You now have an image in keynote, to which you can apply all the snazzy keynote effects. I'll take you through two of my favorites. If you have an image that should visually 'stay together', draw a line around it, then only apply an alpha filter on everything outside that line. There's no need for the lines you draw to be straight. When you use a theme that has a black (or dark) background, it's hard to use any of the Sharpie-colors directly. You could invert the colors, but this gives an unnatural feel. In stead, I like to saturate the image to full black (or red, or whatever), and use a two-pixel white outline. Simple, yet effective!